The Arduino Tron IoT Display is a small and inexpensive display that can sit on your desk or be mounted to a wall. It provides situational awareness, alerts and notification messages from your IoT devices. The Arduino Tron IoT Things events are displayed “instantly” on the IoT Display. You can think of the IoT Display as a single IoT Tiles panel window, focused on displaying priority alerts from you Arduino Tron IoT Things. The Mini Arduino Tron IoT Display can be integrated with any wireless security or IoT alert system, and display alerts for driveway alarms, motion sensor, delivery detect alerts, wireless door entry chime, doorbell or panic button alarms. This very small and inexpensive Arduino Tron IoT Display uses an SSD1306 OLED backlight display module and ESP-01. The IoT Display ESP-01 module is a receiver which connects via the WiFi network to accept IoT data and display the alerts and messages to you instantly. The Arduino Tron IoT Display is a single point to display meaningful alerts for you from IoT devices. This helps you know what is going on with your IoT network and devices. It is much clearer for you to read the IoT Display alert message than for you to fumble for your cell phone to read an alert notification that may disappear. 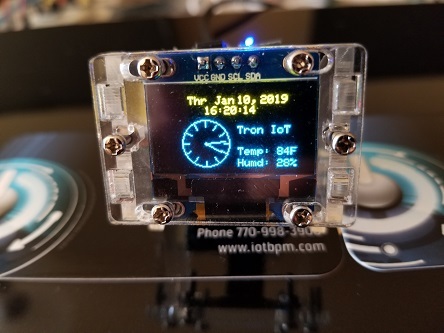 The Arduino Tron IoT Display is a notification module that can also provide information when installed into your equipment or a professional desk interface for your IoT devices. 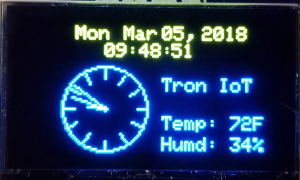 The Arduino Tron IoT Display can be configured to continuously display the time, temperature and humidity, and then display flashing alert messages when they arrive. The temperature and humidity sensor values displayed on the Arduino Tron IoT Display module can be from your office, from outside or from any location in the world. You can read the temperature and humidity from any DHT11 transceiver sensor and create a fully functional weather station. As distributed IoT sensors and applications become larger and more complex, the simple processing of raw sensor and actuation data streams becomes impractical. Instead, data streams must be fused into tangible facts, information that is combined with knowledge to perform meaningful operations. Situational Awareness (SA) is the perception of environmental elements by our IoT devices and events with respect to time or space, the comprehension of their meaning, and the projection of their status after some variable has changed, such as time, or some other variable, such as a predetermined event. This is what we have accomplished with our Arduino Tron AI-IoT Drools-BPM devices implementation. Our Arduino Tron IoT devices are judging and making decisions after cognitive situational reasoning and reporting to the Mini Arduino Tron IoT Display for SA. The Mini Arduino Tron IoT Display little dashboard gives you information on all your IoT devices and Arduino Tron IoT Things. Also, it provides situational awareness, alerts and notification messages from each of your IoT devices. Arduino Tron IoT Things events are updated “instantly” on the IoT Tiles panel. You can view the state of your Arduino Tron IoT Things: Presence Sensors, Contact Sensors, Motion Sensors, Temperature, Water Sensors, Battery Status, Vibration Sensors, Luminosity Sensors, GPS (Location), Weather (Office and Outside), or any equipment from one panel from IoT Tiles panel.